Itʼs OK to post about your products and services on your Facebook fan page. You want customers to know about your business, after all. But limit the commercial messages. A good guideline — direct pitches or commercial message should be 2-3 of every 10 you post. 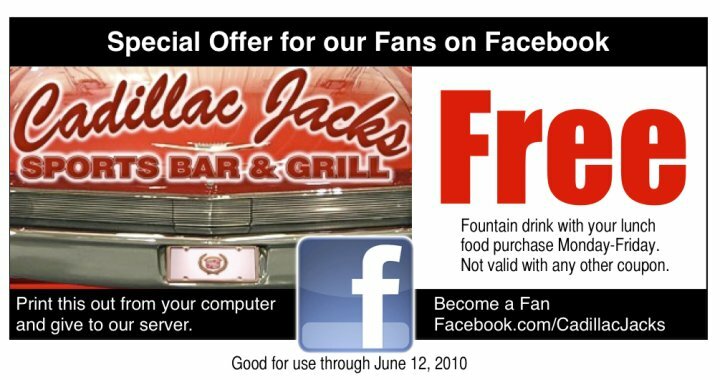 When you do mention your business, be sure to recognize and reward your Facebook fans with special deals, discounts or coupons only available to fans on your Facebook fan page. Facebook offers several coupon tools. Youʼll find them at facebook.com/ applications. Some are free. Some have to be purchased. You can experiment with coupons inexpensively by creating them yourself and uploading them under the Photo tab. Customers can print them out and redeem at your business or event. See the example above from Cadillac Jacks Sports Bar & Grill. When you publish the coupons in photo gallery, your fans are alerted on their Facebook walls and see a link to the coupons. This entry was posted on Sunday, October 31st, 2010 at 11:56 pm and is filed under Business, Facebook, Social Media. You can follow any responses to this entry through the RSS 2.0 feed. Both comments and pings are currently closed.